DNT has floated a proposal for the three new parties to unite to stand a chance against the two heavyweights of PDP and DPT. The offer still stands they say as I interviewed Lekphell today. What is your reaction as President of BKP ? Sonam K Tobgay: As far as BKP is concerned we are not aware of such a “proposal” being heard about lest discuss amongst the parties. This is potentially a dodgy hearsay that does not deserve an answer at this stage. However, one must take note that BKP constitutes a unique DNA right from its inception and is in a remarkable position now to reshape and co-create progressive politics in the country. We stand on our own at this point and would like to continue fermenting ideas of our vision to provide solutions to the complexities of laying strong foundations of democracy as desired by our beloved Kings. The future is inherently unpredictable and it would be unwise for me as the party President making statements towards the too many unknowns there. Email Interview with DNT General Secretary on 2nd June published on 4th June issue. An earlier similar verbal Q&A had also been done around 25th and 27th May published in the 28th May issue. DNT has publicly floated a proposal for the three new parties to unite to stand a chance against the two heavyweights of PDP and DPT and this idea was first floated in 2014 . The BKP President has contradicted DNT saying the discussion never happened even in 2014 even though DCT President confirmed it did happen. Please comment ? Tenzin Lekphell- DNT has publicly floated an open proposal for the three new registered political parties to put people before parties and unite to stand a better chance against two established parties, PDP and DPT, to give our people a better political platform. We are not saying two established parties are bad. They are good but people say good is the enemy of great. 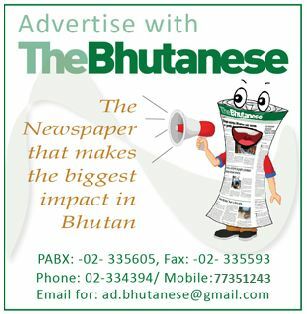 Bhutan deserves better, and we must prevent the risk of “establishment politics” overpowering people. DNT believes that people’s power is more important than party’s power. With “establishment politics,” people get’s sidelined when established parties become powerful. This idea was initially discussed in 2014 during all political parties’ learning visit to Denmark. Do you think BKP President’s statement is a wise move and do you also think this lack of unity will hamper all the new parties’ chances? Please give your comments on DCT’s stand which seems to be more forthcoming then BKP ? TL– Although DNT respects both BKP and DCT, it’s not about DNT, DCT or BKP. It’s about our people versus “establishment politics.” So we request other parties to put people before party and see a bigger vision DNT is offering for the future of Bhutan. 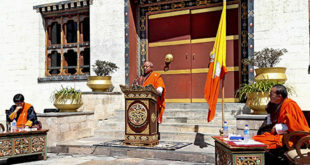 TL– With successive benevolent Monarchs, Bhutan has been blessed with peace, prosperity and happiness. 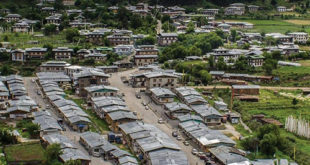 Moving into the future, DNT offers a vision towards people’s democracy, and would like to request the people of Bhutan to nurture this vision for posterity. DNT has publicly floated a proposal for the three new parties to unite to stand a chance against the two heavyweights of PDP and DPT. The offer still stands they say. What is your reaction as President of DCT and would your party consider such an offer? Lily Wangchuk: This is not a new idea as this offer from DNT for DCT was there since 2012, even before the 2013 elections. This idea was again proposed by DNT during the joint multi-party trip to Denmark in 2014 to both DCT and BKP. The merger of the three political parties into a single political entity would certainly make the party stronger. Having a third party, which is equally strong, if not more, would offer an alternative in terms of political leadership and ideology. Besides, having only two political parties dominating the political scene in the country could be unhealthy for Bhutanese democracy. However, my stand will depend on the common stand taken by my party members and we hope to address this at the General Convention. We hope to weigh all the pros and cons and we will take a joint decision that will be in the best interest of our country and democracy. Personally, I am open to all options. As said by DNT is it true that all three parties and their leaders had discussed the idea of party unity in 2014 during the Denmark trip? LW: The idea was proposed by DNT in Denmark to both DCT and BKP. DNT has made it clear that it has become very difficult for new parties to both survive and also break through the primary round with the two established parties PDP and DPT gaining ground in each election and also in between. What are your thoughts on the issue? i) Being six years ahead of the new parties, they had well established party machinery across the country with wide membership and familiarity. ii) As earlier established parties, they have succeeded in winning over many former local leaders and influential individuals in villages since 2007 who continued to play an important role as party workers in the last elections. iii) They also had the financial advantage as most potential financial supporters from well established business organizations were their registered members making it difficult for new parties to mobilize funds. iv) As a new political party, much energy and effort went into the registration process which took us more than two months to register and another two months fulfilling all the requirements to be eligible to contest in the elections and few weeks to campaign. In most places, most voters were not even aware about the new parties and our ideologies. Given the short campaign period, I had to cover two Dzongkhags in a day while driving to the destinations mostly at night. It was mentally and physically draining. As Political Parties in power, both PDP and DPT have huge advantage over three parties outside the Parliament as they are well placed to represent, promote, deliver and stay connected with the population. From the last experience, we have come to realize that both PDP and DPT have strong and loyal supporters and they will continue to support these two old parties. The remaining voters will get divided amongst all new political parties after the majority is gone to two older parties. The above factors will continue to pose challenges for not only DCT, DNT and BKP but any new party that will come into existence closer to 2018 elections.